I'm dipping back into the archives this week for another 'Lost Week In Vexillology' this time featuring the last flag of Central America on my list- last, but very much not least, we've got the flag of Belize. 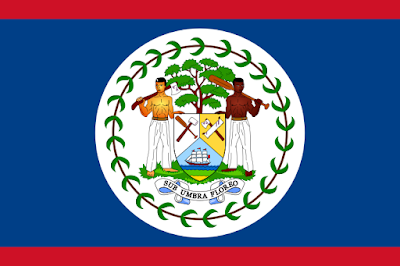 A relatively new flag, as flags go, the flag of Belize was adopted on September 21st, 1981 which was the country's very first independence day. From 1870 all the way up through 1981, the country was a British colony known as British Honduras. It features the Coat of Arms at the center and the colors blue and red. We'll get to the Coat of Arms in a second, but let's deal with the colors first. Belize (like the Seychelles and Panama and a few other countries out there I can't remember) struck a political compromise with their two main political parties at independence. The People's United Party (PUP) had colors of blue and white- which were originally proposed for the flag, but surprise surprise, the United Democratic Party wasn't about that had the colors of red and white. So, how do you get to a compromise? You add some red stripes at the bottom and the top and then you have combinations of both red and white and blue and white in the flag. Everybody's happy. And that's the flag of Belize! Remember, until next time- keep your flags flying, FREAK or otherwise!